Well hello. Bit of an unintended break there. I was sick for a week (sinusitis turns every little cold into a bed-bound week of hell), then had a trip away with work. Two quite lovely sewing-related things have happened since I last posted – as well as some real sewing, below. First, I had an email (and a tweet from Jen!) to let me know that my lil’ space here has been nominated for a Bloglovin’ 2015 Award. I don’t know if the nominations were reader-voted or internally decided, but either way I can’t help but be extremely flattered and a bit proud. I know awards are always subjective and ultimately don’t mean much, but it’s a lovely boost to be recognised by a platform I use every day. If you’d like to see the other nominees and cast a vote, you can do so here. Right, on to some actual sewing. So I recently bought the Papercut Anima pants pattern as a PDF. I know, it’s pretty similar to the True Bias Hudsons and I try to reuse patterns rather than buy similar ones, but what made me buy Anima in particular was the faux fly front, which I’d never been able to wrap my head around how to construct. They’re a quick and simple sew, a gentle single session type of project. The PDF was a manageable printout at around 25 pages and went together easily. I generally sew an S in Papercut but cut the M for these because I’m larger around the hips and wanted them loose. I think the S would’ve given me a closer fit more like the pattern photos – good to know I can just print it off again to try the smaller size sometime. 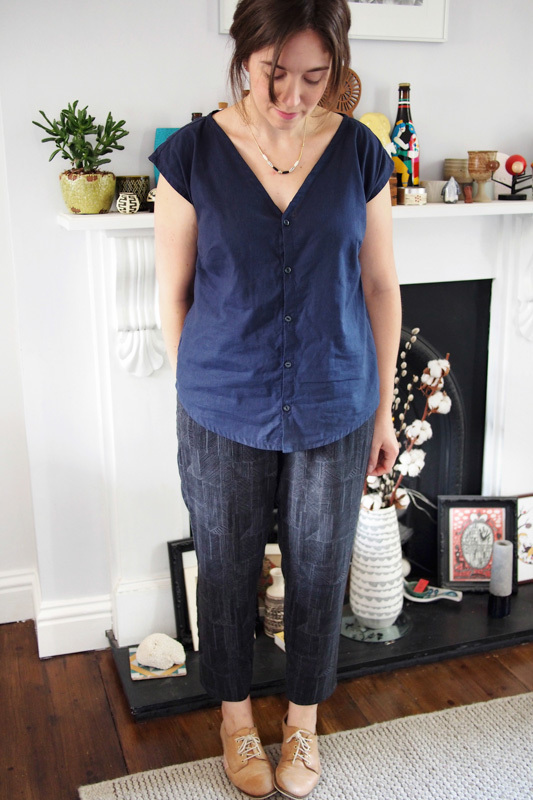 I sewed them per the instructions with no fit adjustments, except omitting the cuffs and just hemming the legs – I liked the ankle length finish and was hoping to go for a sort of soft tailoring look rather than full-on sweatpant. I’ve just rolled up the cuff a bit here for a peek of the slightly contrast inside. The fabric’s a mega lovely French terry kindly sent to me by the newly opened UK arm of online knit fabric specialists Girl Charlee. I’d ordered from the U.S. Girl Charlee site before so was really pleased to see they moved to our shores too – no worries of getting stung by high postage and customs charges. 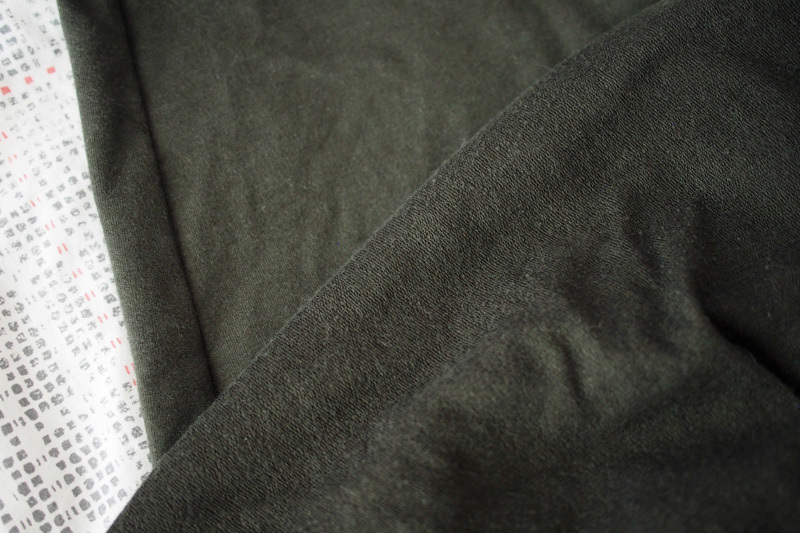 Founder Mark Creasy let me pick a couple of fabrics to try, and this is the modal blend French terry . Ummm, I love this fabric. It’s insanely soft and has beautiful drape. 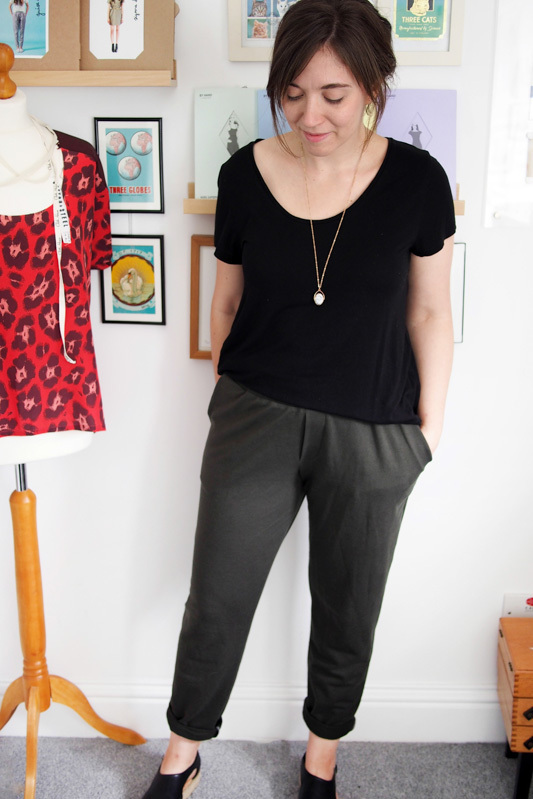 I think it definitely helps these pants to look a cut above sportswear or loungewear – I had the Anima in mind when I ordered it and it was definitely perfect for this project. It comes in Sandalwood brown as well as this Deep Forest shade and it’s just £6.95/m. i’ll definitely be getting some more come the colder weather. 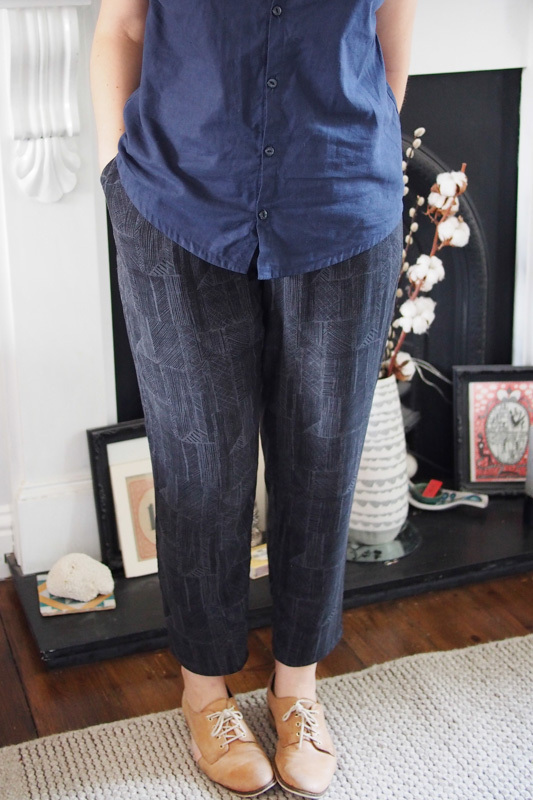 Given the loose fit I reckoned they would work as is in a woven fabric, so I cut a second pair pretty quickly in this gorgeous viscose I got in Chester’s Abakhan store. I’ve been living in these since I finished them to be honest. 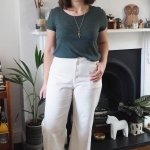 They seem to go with all my plain tops (this is another Aster hack in linen) and are so comfortable – great for cycling and nice and light and breezy. I didn’t need to make any fit changes to make them work in a woven. Perhaps if you picked a snugger size you’d want to size up one to make sure they drape well. I omitted the topstitching and drawstring this time for a smoother waistband. I’d love to try hacking around to make a flat-front waistband sometime too. Nice to have another TNT everyday pattern in the stash! Love that faux front fly! As I was reading I was trying to figure out why they looked so familiar. I looked down and realized I am wearing my True Bias Hudson Pants made in the exact same fabric! 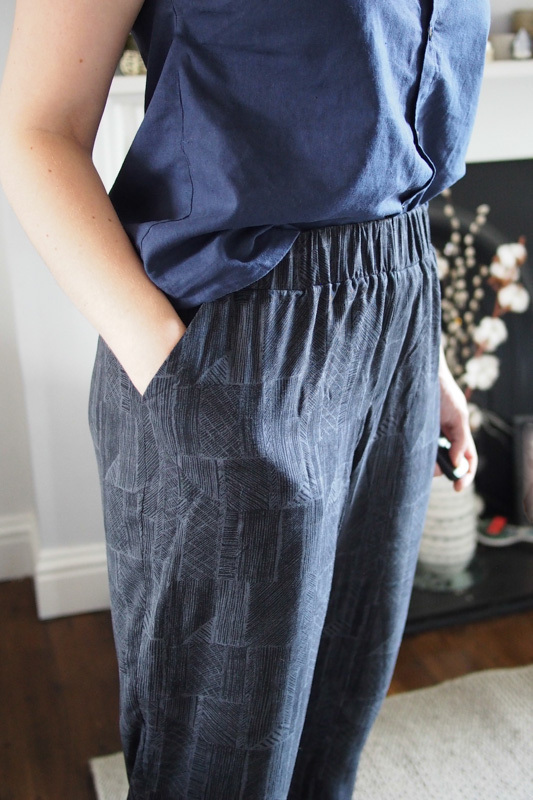 I love wearing them for lounging around in and the fabric has held up very well with minimal pulling! Congratulations on the nomination !! Love those pants. They look comfortable and super stylish. I’ve used that same french terry for a pair of hudson’s, and it’s just the perfect fabric for such. Love your new pants, and congrats on the nomination! Congrats on the well deserved nomination. Love those trousers! A big congratulations on your nomination! Fabulous trews too! Congratulations on your nomination. I just read about your sewing space in Love Sewing, too. Thanks, and ooh, haven’t seen that myself yet. I sewed up the sample top on the cover, too! I didn’t make it I’m afraid, I still go to Cos for plain tees occasionally. But the Deer & Doe free Plantain pattern is very similar! Lovely trousers, very flattering, especially your choice of fabric. 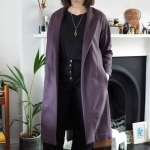 I made a similar pair from a Burda pattern and love them. Am now wondering how I can make them for winter. Something thicker but what? Ooo very nice! And well done on the nomination :-) I got some of the modal blend french terry too and I can’t wait to use it – so soft! Hooray for girlcharlee in the UK! PS. Glad to hear you’re better, sinusitis is hideous. Thanks Jane! Yes it’s passed thankfully but really not fun. Thanks. They are definitely secret pyjama territory comfort levels! Your pants look great! I’ve yet to try out this silhouette other than Hudson track pants, but you are making me want to try! Congrats Katie!! That is so awesome about being nominated for a Bloglovin’ award, and so cool to have such amazing support from your co-workers! I would be really interested in how sewing for co-workers would go, if you decide to do it. Sewing for other people interests me and freaks me out at the same time. 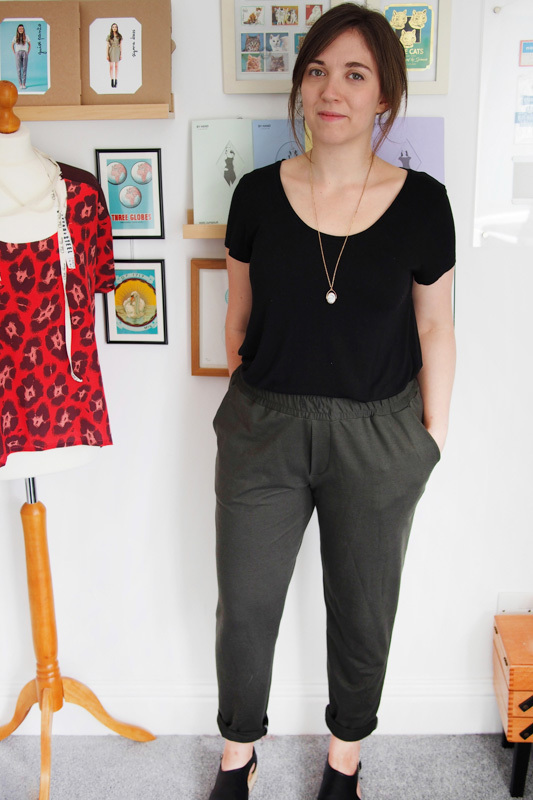 I love your Anima pants too – both great fabrics too! Congratulations on your nomination! 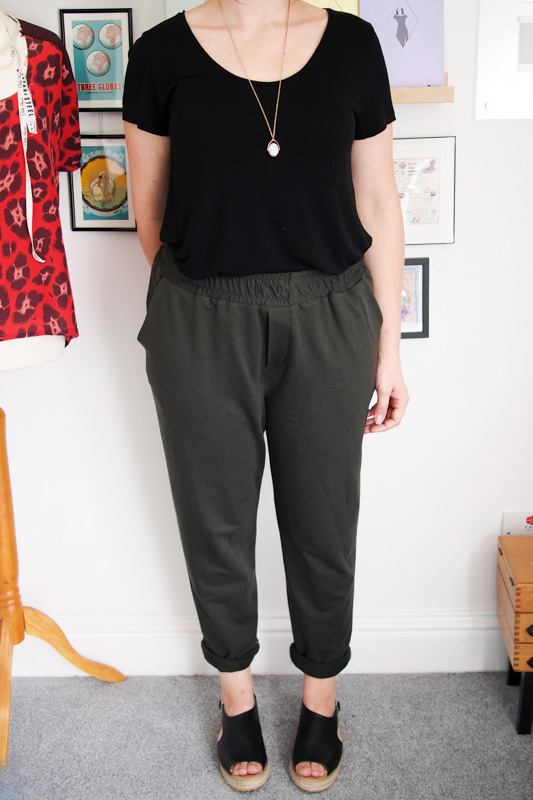 Love both pairs of pants, this style is so easy to wear. I have a pair of rtw with the faux fly front that I love so may have to try this pattern so I can replicate. Thanks! The faux fly was definitely a head-slap moment once I read the instructions – very simple. Congrats on the nomination Katie, you deserve it! Love the French terry pants. I’m going to be in the UK later in the year, so think a Girl Charlee order sent to my in-laws is in order. I might have to hit you up for some other fabric shop recommendations too! Thanks Diane! Will you be coming anywhere near London? Yes, hopefully! It would be lovely to catch up if you’re around (I’ll be over in October). I’ll email you before I come! And congrats on your Bloglovin’ nomination!! What type of interfacing did you use on the Anima? The instructions don’t make it clear what type and I’ve found it hard to find the American knit stay tapes in the UK. Thanks! I think i skipped it to be honest – it is just used behind the button holes? Ray Stitch has stretch knit interfacing.